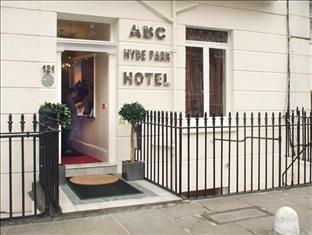 ﻿ ABC Hyde Park Hotel London. JIMAT di Agoda.com! Hanya 400 meter dari Stesen Paddington London, ABC Hyde Park Hotel mempunyai kaunter penerimaan tetamu 24 jam dan WiFi percuma. Hyde Park terletak hanya 700 meter jauhnya dan Oxford Street berada sejauh 15 minit berjalan kaki. Bilik-bilik tidur yang elegan di ABC Hotel mempunyai bilik mandi peribadi yang moden dengan alat pengering rambut. Semua bilik menawarkan alat membuat teh/kopi dan TV dengan pemain DVD serta saluran satelit. Sarapan kontinental tradisional dihidangkan setiap hari di ruang makan yang terang dan lapang di ABC Hyde Park. Sarapan termasuk kopi segar, jus buah-buahan dan pilihan bijirin. Terletak di pusat Paddington yang meriah, ABC Hotel Hyde Park berjarak 15 minit berjalan kaki dari Marble Arch. Knightsbridge berada sejauh 20 minit berjalan kaki dan Madame Tussauds terletak hanya 1.6 km jauhnya. Not only are the rooms and facilities clean and comfortable, but the staff is wonderful. Agoda made a mistake and let me book a single room even though I was traveling with my son—the staff at ABC was more than accommodating and figured out a way to make things work for us. They were very attentive and fun to talk with on the way in and out. The hotel isn't cheap in terms of money, but it is cheap in terms of looks - it's old, not well kept, not very clean. There were some minor but annoying issues with my room - some electrical sockets worked only on and off on random; the windows were poorly fitted so there was draught and cold air coming in the room; the shower tap wasn't working properly so the water was too hot and couldn't be regulated. It was an okayish stay, but I wouldn't stay there again. Not so bad. The tv was a bit difficult to work with. its clean, free wi-fi, friendly staff. read most reviews and most were positive. a bit pricey for a small room, but in London its as good as it gets. very clean room (very important for wife), clean bathroom. wi-fi was always functioning and fast. friendly staff (1 more so than the other :)). will definitely come here again. they served free breakfast, but never tried it. close by to the tube, and the rail connecting to heathrow airport. Stayed for two nights. This really is a place to sleep. Considering you are visiting London if you are here, you won't spend much time in the room anyway. I was in the basement room opposite the breakfast room but still had natural light. Room was tiny but clean enough and with tea/coffee provided. Bathroom also tiny, but did everything I needed it to. Most important for me was the location. Just 2 mins walk from Paddington Station, which is in turn a 15 minute train ride from Heathrow and also of course the underground. The hotel is also a 5 minute walk from the Italian gardens in Hyde Park, and more than once I walked from the hotel right into central london through Hyde Park, Marble Arch and Oxford Street approximately 20 mins away. The local area around Paddington is also great, loads of restaurants, pubs, bakeries, cafes, shops etc....everything you need. Overall a pleasant stay in a tiny but clean room in a great location. The biggest problem is that the hotel does not have an elevator and we were given a room on the 4th floor. Fortunately the hotel staff was willing to carry our luggages for us to the room. Another problem is that the wi-fi service did not work, and we had to use Internet in the McDonald's nearby. The hotel room and bathroom are good. It is located near the Paddington station which is convenient to travel around. I have slept in room 2 for one night, which is on the basement. It was the smallest room I have ever seen, not more than 10 square meters. Albeit I am fully aware of the size of the hotel rooms in London, I was not expecting it at all. Room was decently cleaned, however I could not sleep well because I could hear every noise from the floor above. Walls are not thick at all. Breakfast was ridiculous, bad food and freeze-dried coffee. Hotel staff not helpful. I wouldn't recommend to sleep there for more than one night. ...this was the tiniest room i ever rented in my life! I had to laugh out loud, when i entered it. Ok...it is London, it is cheap...and it did the job, to stay for one night. The service was non existent, i had to carry my luggage down on a very narrow stair and i nearly fell. I ordered a wake up call and they forgot it!!! - which is a big deal breaker for me. The guy at the counter was not rude, but also not friendly at all and so i decided to never go back there again - and rather pay a little more and hope for a better service. Location of hotel is excellent, nearby to amenities and shopping. It is clean and rooms were good. Receptionist needs to improve their level of communication with hotel guests and should brief the guests on the facilities available at the hotel upon check in. Dissapointment was that due to mix up between agoda and the hotel on the room rate offered, it was not briefed to me upon check in, and the first receptionist was not friendly during check in, a signel room was given instead of the double, which was booked. Facilities available was only mentioned when asked after entering the given room.